If you can get someone else to do the dirty work for you (that is, the cleaning), squid is perhaps the simplest and least fussy seafood out there. And it requires only the briefest of cooking times – about 90 seconds to two minutes per side should do it. They taste like smoky, briny heaven coming off the grill, bathed in a simple marinade of garlic, olive oil and lemon juice, and tossed with cherry tomatoes, bitter greens and garbanzo beans. This is the kind of salad that’s made for summer. It’s a cinch to prepare and it tastes better if you eat it outside. And it has all the protein you need for a light evening meal! Done and done. 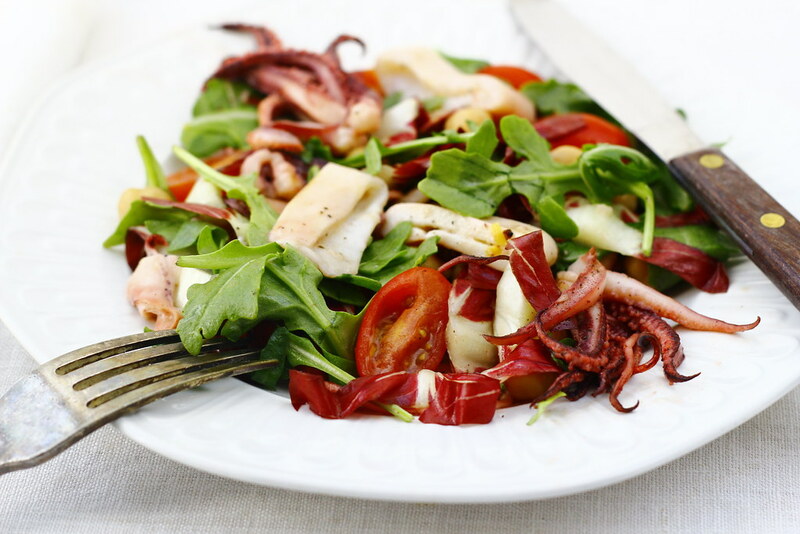 This Grilled Squid Salad recipe is part of The June Seasonal Food Guide. First, marinate the squid. In a mixing bowl, combine the squid with 2 tablespoons olive oil, half the lemon juice, the minced garlic, and a generous sprinkling of salt and pepper. Set aside. You’ll want them to sit for no more than a half hour in their marinating liquid, because the acid of the lemon juice will start to cook them. Prepare your grill for the squid. 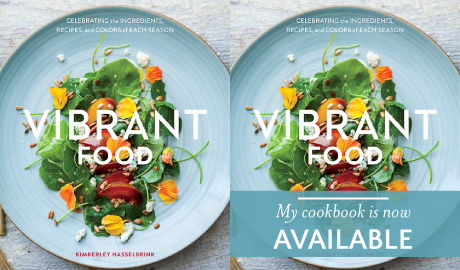 While the charcoal briquettes/gas grill are readying, prepare the rest of the salad by mixing together the cherry tomatoes, arugula, radicchio and garbanzo beans. Set this aside and dress at the very end. Remove squid from grill. Slice squid body into one inch sections. Leave tentacles whole. Toss squid with the rest of the salad. Add the remaining lemon juice, another tablespoon of olive oil, and salt and pepper to taste. Mika - I cleaned tons of squids working in restaurants…I should not say this because I’m vegetarian, but that was pretty relaxing… ^_^ No one is going to ask you anything because you are dirty and concentrating on your infamous job. brainfeed.me - i love your eye for esthetics! the colors of this dish are so fresh a striking. love it! also, it looks light, healthy and tasty! 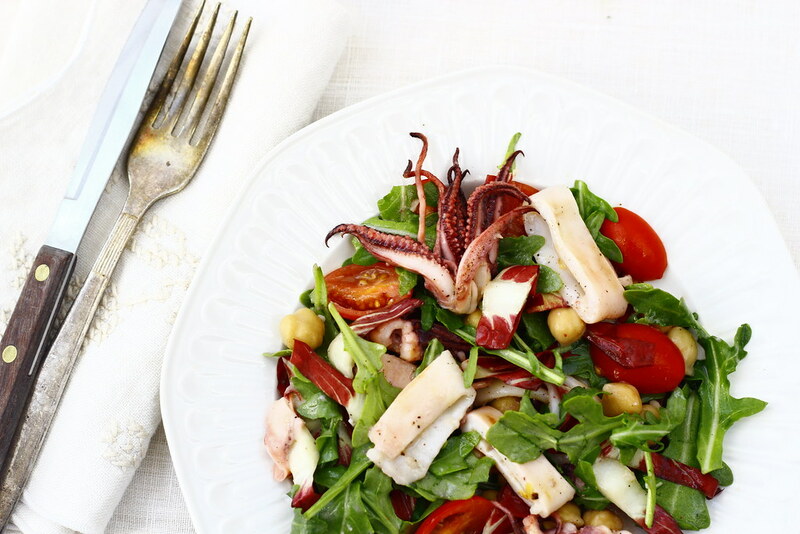 i’m in tuscany at the moment and i can’t wait to hit the harbor this evening and get a squid directly from the boat to try this recipe!